to put down roots and make their home Grass Lake. Fields spread, and roads entwine like lamb’s wool spun. the shingles like pages of a yearbook. This collision of form and resistance to form, of building and destroying, can also be found in Lewis’s rich imagery. She entwines the land, the home, and the body into a triple helix, like strands of DNA. In Sonnet II, C describes the land as “green, rolling acres begging to be sown/with any seed to find a womb” (6). As he is building his barn, the beams are “reaching up to the sky like ribs (Sonnet III 7).” The newly-build road has a tongue and is tattooed “It came to give. It also came to take” (Sonnet V 9). The humanity inherent in C’s and A’s home makes its destruction all the more poignant. Issa M. Lewis, as deftly as the matriarch A stitches an American flag while her son is at war, fuses worlds: old and new, town and country, living and dead. Recording is never easy, “But only when she sets the blue star’s place/does she drop the needle, hide her face” (Sonnet VIII 13). By integrating the organic and the man-made within the structure of a strict form, Lewis replicates an old life-line, reaching back, while being moved forward, through time. These are poems that pulse through our veins, like blood. 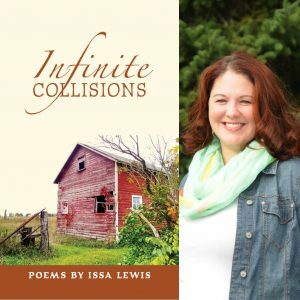 Infinite Collisions succeeds, not only in its clarity and weaving of story, but on a physical level, which is where poetry is always most pure. Jennifer Martelli is the author of The Uncanny Valley and Apostrophe, both from Big Table Publishing Company. Her chapbook, After Bird, is forthcoming from Grey Book Press. A recipient of the Massachusetts Cultural Council Grant in Poetry, Martelli is an editor of MER Online and is also a reviewer at Up the Staircase Quarterly.